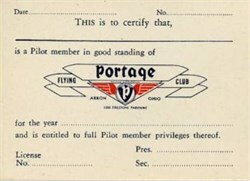 Beautifully printed unissued membership card from the Portage Flying Club printed in 1946. This historic document has the company's logo printed on the membership card. The flying club started out in 1945 as the Firestone Flying Club and changed its name in 1946 to the Portage Flying Club. They lasted until 1950 when it appears to have disolved. The club flew a Cessna 150 and a 1946 Stinson 108.